Years ago, I was feeling creative one day. I had bought these cabinet door inserts at Canton. I think the trend at the time was stenciling on them. I'm not much into trends or arts and crafts, usually. 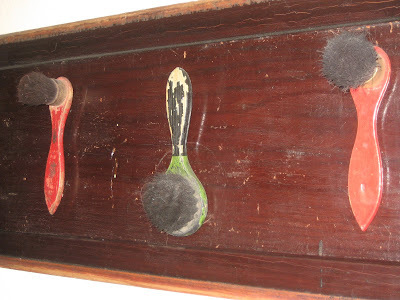 These old shoe shine brushes were my grandfathers. Short screws through the back did the job. Simple. I am so proud, because I DID something. *grin* Again, not my general inclination! I did it years ago and I still feel accomplished when I see it on the wall. Just thought I'd share. I'm not at all sure that there will be a Saturday garage sale here tomorrow, as I have not managed to get anything together. Oops! Any requests? I'll dig around for your desires if you have any. 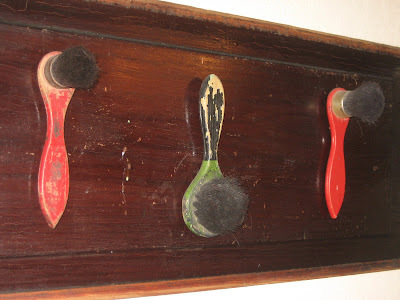 That's a cool way to display family items! As far as the garage sale, it's always a mystery what I'm drawn to. Usually, metal objects. I would really like some of those vintage garden markers/stakes...the metal ones with a rubber strip around the top that people use to label what's in their gardens. Let me know if you have any! And I also want two vintage restroom signs...you know the white metal signs with the black letters that read "Ladies" and "Gentlemen." If anybody's got 'em, let me know! OMG!!! I LOVE this idea! Especially the fact they are sentimental. Oh, tooo cute!!! 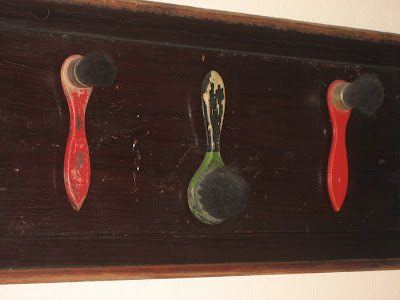 I love the old painted shoe shine brushes. Green and red, can't help cause happy! Nice job! Yay! You did a project! I love the added sentimental value of it too. Great job!